Twickle Purple Sedum is an excellent groundcover. The foliage is deep green, needle-shaped that turns bronze in the summer and maintains the color through the fall and winter. It is semi-evergreen in the winter. 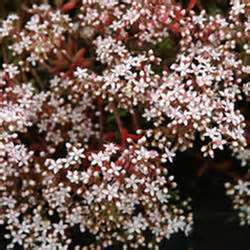 In early though midsummer, small white flowers adorn this plant. The flowers will attract butterflies and bees. It will grow to a height of 2" to 4" tall and spread from 1' to 2' in width. Plant Twickle Purple Sedum in full sun to partial sun in well drained soil. Twickle Purple Sedum does exceptionally well in hot, dry sites. Plant Twickle Purple Sedum in a Rock Garden, as ground cover, in rock walls, green roof, or in mixed containers. It is deer resistant and drought tolerant once it is established. Twickle Purple Sedum also makes a great lawn substitute tolerating light foot traffic. It is also a Firewise Plant.